does it look like it’s flying? Makes me think of Everfrost in EQII. I’m pretty sure that rocketpier is taking off. No really, it looks like a city on top of a huge platform above the clouds. Rocket dock is ready for takeoff! It that ice or salt? I’m no expert, but it looks a lot like salt deposits. Maybe at the Great Salt Lake? hmmm good question. 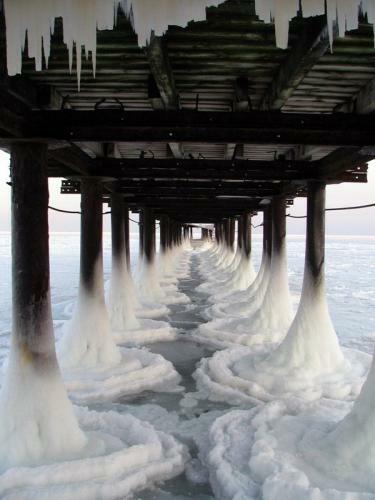 I have seen some icy lakes with piers but I can’t say that I’ve ever seen one freeze like that to tell you the truth.